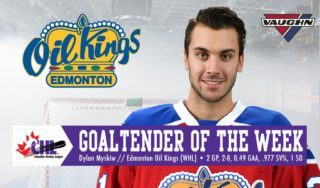 You couldn’t have drawn up a better three-in-three for the Edmonton Oil Kings this weekend. 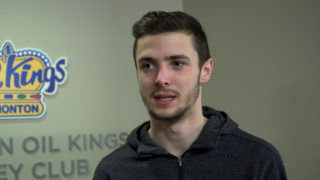 Liam Keeler had his first career two-goal game and Trey Fix-Wolansky posted a three-point night as the Oil Kings (24-14-4-3) defeated the Lethbridge Hurricanes (24-12-4-4), 4-1, in front of 5,511 fans at Rogers Place on Sunday evening. 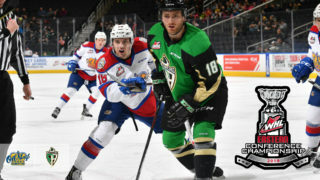 The win gave the Oil Kings a 3-0-0-0 sweep during their busy weekend action, all of which were versus divisional opponents. Tonight’s win over Lethbridge was the second vs. the team in three nights as they downed the Hurricanes on the road on Friday night, 5-1. The two points puts Edmonton back into sole possession of the lead in the Central Division standings with 55 points, leapfrogging the Hurricanes (54). The idle Red Deer Rebels currently sit third in the division with 53 points. Fix-Wolansky’s three-point night puts him just four points back (75) of the lead in WHL scoring behind Portland Winterhawks’ Joachim Blichfeld (79). 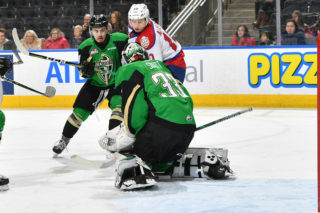 For Oil Kings goaltender Todd Scott it was an impressive weekend, earning a win on Friday night before improving his record to 4-1-2-0 with a 31 save performance tonight. 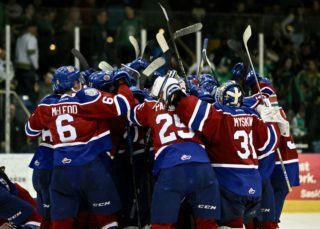 Liam Hughes (12-18-3-1) took the loss in the Lethbridge goal, allowing four goals on 33 Oil Kings shots. Past the midway point of the opening period the Oil Kings took a 1-0 lead as Keeler notched his seventh of the season, from Ethan Cap and Fix-Wolansky, at 11:43. Just 2:38 later Keeler cashed in his second goal of the night, extending the Oil Kings lead to 2-0 with a shorthanded goal which started with Cap springing Fix-Wolansky into the offensive zone. Fix-Wolansky danced in and perfectly deked Hughes, faking a shot before finding Keeler wide open at the side of the net. Shots on goal in the opening 20 minutes of play favoured the home side, 11-8. The hot stick of Vince Loschiavo continued to burn as the veteran buried his 21 of the season, robbing a Hurricanes defender of the puck then surging in all alone only to outlast the Lethbridge netminder and extend the Edmonton lead to 3-0, unassisted, at 5:41. Loschiavo’s marker now gives him goals in three straight games. It was the lone goal of the middle frame, as Edmonton again outshot Lethbridge, 14-9, for a two-period total of 25-17. 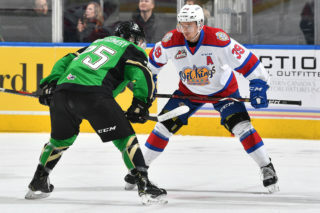 Just over three minutes into the third period Fix-Wolansky tallied his third point of the night and 25th goal of the season on the power play, putting his team up 4-0 with the assists from Carter Souch and Josh Williams; his first career point as a member of the Oil Kings. Jake Elmer’s 20th of the season ruined the shutout bid by Scott, as the power play marker from Dylan Cozens and Nick Henry made it 4-1 at 8:02, but it was as close as the Hurricanes would come as the Oil Kings earned the crucial two points against their division rival. Final shots on goal were 33-32, Edmonton. Lethbridge was 1-for-5 on the power play while Edmonton finished the night going 1-for-5 with the man advantage. Todd Scott (EDM) (3), Trey Fix-Wolansky (EDM) (2), and Liam Keeler (EDM) (1) were selected as the Three Stars of the Game. Wyatt McLeod, Andrew Fyten and Conner McDonald each wore an “A” and skated as alternate captains to Trey Fix-Wolansky. The Oil Kings are back in action when they return to Medicine Hat mid-week to take on the Tigers on Wednesday, January 16 at 7:00 PM MT. Their lone game next weekend will take place on Saturday, January 19 when the Calgary Hitmen come to town for a 1:30 PM MT start for the team’s second annual RE/MAX presents: WHL Suits Up with Don Cherry to Promote Organ Donation game. The Oil Kings will don commemorative Don Cherry-inspired jerseys which will be silent auctioned during the game with proceeds supporting the Kidney Foundation of Canada. The game serves as the first half of a Battle of Alberta doubleheader at Rogers Place which afterwards sees the Edmonton Oilers host the Calgary Flames at 8:00 PM MT.